This AIA award-winning, two-story penthouse condo, designed by the renowned Jim Olson, is the epitome o f downtown Seattle waterfront living. 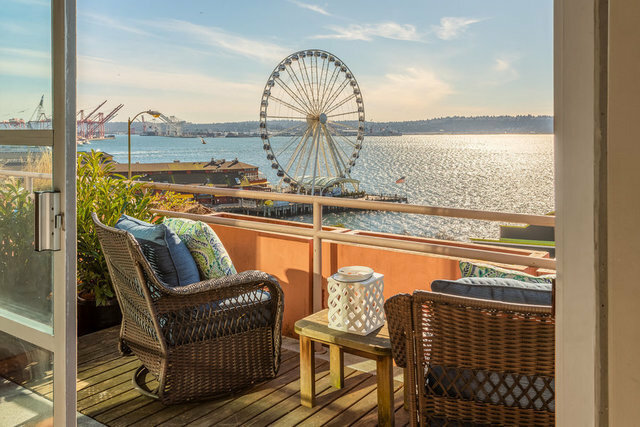 Enjoy 180-degree, unobstructed, panoramic views of Elliott Bay, the Olympics, the Great Wheel, Seattle Aquarium, all the way to SoDo from your Western-facing living room balcony. Easily grab your morning coffee, fresh flowers, or a delicious dinner across the street at Pike Place Market. Featuring private parking and storage with thoughtful touches throughout; including custom cabinetry, closets, built-ins, and heated floors. Three private balconies provide endless, sweeping views of the waterfront and city. Hillclimb Court will be the heart of the newly designed Seattle waterfront and everything it has to offer. This is your perfect opportunity to own this majestic property now before the almost billion-dollar project is complete!